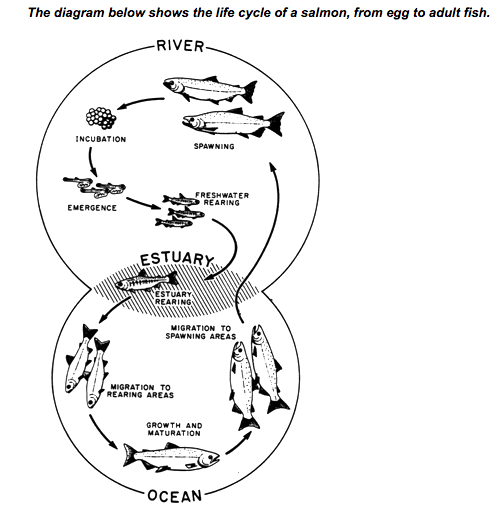 The diagram below shows the life cycle of salmon, from egg to adult fish. The diagram illustrates stages in the life cycle of a salmon fish, from roe to maturity. The salmon spends the first half of its life in freshwater rivers before moving to an estuary and finally reaching maturity in the ocean. It returns to the river as an adult to reproduce. Firstly, adult salmon mate and spawn eggs in a river. The eggs are incubated in these waters til fry emerge. Salmon fry continue to inhabit the river and grow. In the next stage of the cycle, the adolescent salmon travel to an estuary to spend a part of their life there. Following that, they then move on to the ocean where they continue developing physically and finally become a full-fledged adult salmon. Upon reaching adulthood, the mature salmon then begin their journey from the ocean towards the river in order to spawn in a freshwater habitat. The adult fish bypass the estuary and head directly to the river to mate and lay eggs. Lastly, the cycle continues when salmon offspring hatch and go through the stages described above.